4.0 out of 5 based on 21 bloggers and 7 commenters. 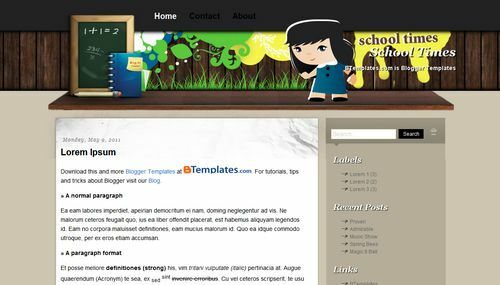 School Times is a free blogger template adapted from WordPress with 2 columns, right sidebar and girly looking. Excellent template for blogs about education or people. in this template can i delete this word (school times)…if i can do that what should i change in the code??? Now edit that image in any image editor (gimp, photoshop) to remove the words “school times”, save the image, upload the image in any free photohosting (like tinypic or picasa) and go to Design/Edit HTML in your blog to replace the URL above by the URL of your hosted new header (the URL provided by the photo hosting). Thanks for the template i really like it, i’ve just tried right clicking on the image to remove it and i’ve tried modifying the image but cannot find it in my HTML code, instead of school times i want it to say ‘teaching resources’ is there an easy way to do this? anyone here know how to open the layout if with this theme?